As an ERP salesperson for over 20 years, I have seen many changes with buyer habits and I’m always trying to figure out the best way to impart knowledge in order to help with the decision-making process. After all, the decision to purchase ERP software is a big one and should not be taken lightly. In this day and age, companies are using the web in a very smart way to research products and potential vendors. But the brick wall has always been the ability to actually drive the product on their own without a salesperson breathing down their neck and trying to hold their hand. When I first heard about the myERPcloud project, it resonated as the right approach for our times. At myERPcloud, you can sign up on your own to take a test drive and, depending on your industry, also see firsthand how 3rd party add-ons can enhance additional functionality to the core product. Product demos with the vendor are good, but my experience tells me that they always leave a prospect with more questions. Often they would like to see it again, share it in-house, etc. That hill has been climbed with myERPcloud and I’m very excited to be a part of this inclusive approach to product research. 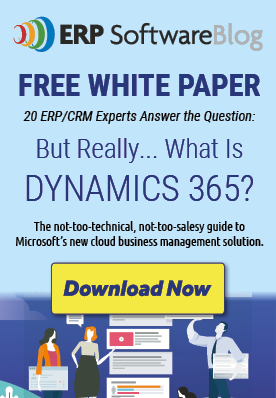 As an approved myERPcloud partner, please let us know if you have any questions about how to try out Microsoft Dynamics GP in the cloud. You can also read more on this press release: Sherwood Systems Named as an Approved Cloud Partner with myERPcloud or visit our myERPcloud profile page. Make Your ERP Consultant Walk In Your Shoes!